You are here: Home / Sustainable Storytelling / Get Dieselpunk(ed)! [dropcap2]B[/dropcap2]ut, in remaining true to punk form, I’m sticking it to the wikipedia man (who oddly started as a subversive sort of fellow years ago) by posting a link to the buried wiki along with some other great resources for getting dieselpunk(ed). A great place to begin your journey both punk and diesel is to check out the friendliest nerd hollow the aether has to offer — Dieselpunks.org The site serves as much more than a forum. Search its articles and discussions for some of the best music, art, and culture links to all things DP. Along with DP.org there is also The Gatehouse. These two sites together create the heart and soul of DP (not Dr. Pepper, which will always be my first DP love). As far as I am aware, The Gatehouse Gazette is the only strictly dieselpunk journal. Check it out or you’re merely reading with gas. 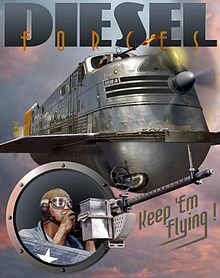 There are several provocative personal blogs out there for getting your eyes greasy with dieselpunk, but the two I know the best are Lord K’s blog and Dieselpunk Larry’s blog. I love the aesthetic, but ‘dieselpunk’ is just a name for it invented by two people on the internet. Have to agree with the wikipedia nerds on this one. Everyone else calls it retro-futurism. That’s what it’s called. It’s focused on the Golden Era and deco, sure. But it’s retro-futurism. The dieselpunk-name-inventors trying to extend it to even cover Mad Max, which is a defining work of post-apocalyptic fiction, and not dieselpunk or ‘petrolpunk’ as they called it, just because gasoline was a big plot point, really hammers home what the term really is. Free-form invention by fans on the internet. Thanks @jellydonut for the thoughtful response. Isn’t retro-futurism the term used in reference to everything from clockpunk, steampunk, dieselpunk, etc.? My take has been that people desire to break down retro-futurism into distinct sub-genres based on eras. Steampunk is the most well accepted at this point. Wikipedia has embraced this term even though it is also retro-futurism. You are indeed correct that all of these aesthetics and countercultural movements are indeed retro-futurism. The sticky wicket is how do I communicate the difference between a 1940’s anti-natzi retro-futurism from a 1860’s post-apacolyptic Civil War retro-futurism?